I read most of the Moomin books as a child (I wonder where those books are now!) 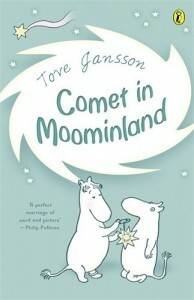 and my daughter really enjoyed Comet in Moominland which is the second book about the Moomin family who live in a blue house in Moominvalley. The first Moomin story, The Moomins and The Great Flood, was first published in 1945 so, like Pippi Longstocking, the Moomin family are celebrating their 70th birthday this year. The Story: While out exploring Moomintroll and Sniff discover a strange symbol carved onto tree trunks. At the beach they find a cave and the same symbol appears on the floor. The Muskrat, a philosopher, tells them that the symbols show that a comet is coming so Moomintroll and Sniff set out on a journey to visit the Observatory to find out more. After a long and hazardous journey, during which they are joined by Snufkin, they speak to a scientist who tells them that the comet will arrive in a few days. On their way home Moomintroll rescues the Snorkmaiden who joins them with her brother, the Snork. Accompanied by a stamp collecting Hemulen they reach Moomin Valley in time to seek refuge from the comet in Moomintroll and Sniff’s cave. The journey to and from the Observatory provides lots of adventure. Moomintroll and Sniff must navigate a river full of crocodiles, deal with a large lizard and find a way of escaping from an underground river. They spend just enough time at the Observatory to ask the scientists when the comet will arrive before heading back to Moominvalley. On their way home Moomintroll bravely rescues the Snork Maiden from a poisonous bush before they navigate the dried up seabed and survive a tornado. Moominmamma and Moominpapa are delighted that they have returned safely and after packing up as many of their belongings as possible they join Moomintroll and his friends in the cave to wait for the comet. My daughter was fascinated by the range of characters that are introduced throughout the story, they all have very distinctive personalities and characteristics. The Snorks look similar to the Moomins but they change colour according to their mood, the Hemulens have quite obsessive personalities and often collect things and we love Snufkin and his lust for adventure. We would have liked to see more of the Hattifatteners and my daughter was disappointed that Little My, who she already knows from Moomin and the Moonlight Adventure, wasn’t in this story – she’s her favourite Moomin character. You can read more about the individual characters here. 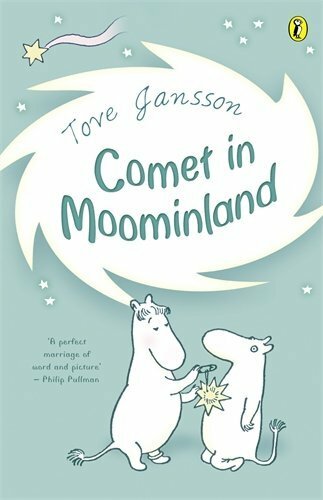 Comet in Moominland is the seventh book that we have read for the 2015 Classics Challenge and we are looking forward to reading more. Do you have a favourite Moomin story? Moomin news and more information about the books can be found on the Moomin’s website which also sells a range of Moomin memorabilia. Happy 70th Birthday Pippi Longstocking! They haven’t aged at all have they?! The stories are really timeless and this one was action packed! Oh I can’t believe the Moomins are 70 years old! They’re so lovely, I never read the books as a child but I loved the TV show! They look good for 70 don’t they 🙂 I’d forgotten about the TV show! I totally remember these from when I was a kid. They were fantastic! Thanks for reminding me of them I’ll have to dig around and see if I still have them in storage. You’re welcome Marissa, I wonder where all my childhood copies went. I had several but I guess you can’t keep everything! I never realised they were so old, either. I wonder why I never read them? Maybe they were too ‘modern’ for my family! I think I ought to rectify that and read a couple some time. Thanks for sharing it on the Kid Lit Blog Hop. 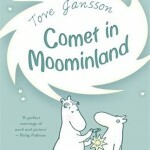 I loved Pippi Longstocking as a child and my kids do too but I’ve never heard of Tove Jansson before! Thanks for the heads up and for sharing at the Kid Lit Blog Hop! His books sound great! !